-Idealist? Who is an idealist these days? John cried out. - Well, I am an idealist for that matter and so were almost every philosopher through the entire history, responded Matthew. -Isn’t that strange don’t you think. Philosophers were idealist back than because there were no scientific explanations, like evolution for instance. Almost all the philosophers from the 1900-centruy like Marx, Freud, Sartre had a materialistic world view, Said John. -Well the materialist thinkers can’t explain consciousness, said Matthew. -Maybe scientists can’t explain consciousness, but maybe consciousness is an illusion? -If consciousness is an illusion than the illusion is consciousness. You can’t escape from the fact that you exist. You can deny and be skeptical about everything. You can doubt that we are sitting on a train, you can doubt that we are having this conversation, you can doubt that this is the reality, you can even doubt that you have a body. But one thing you can’t doubt is that you are conscious. You think, you are conscious, therefore you are as Descartes put it. - I will give you that argument and I get your point, but why turn to idealism when there is no evidence for an immaterial world? What makes you believe in a non- physical reality? John asked. -Well as I said, consciousness is my biggest problem, scientists cannot explain what consciousness is and how it arises. How can I have the ability to be conscious of my own consciousness, in other words ; How can the self be aware of it self, that is the key equation that no philosopher or scientist can solve. Physicists can’t even explain what matter is thou they are experimenting with matter every day. Ask a physicist what matter is, and you will see what kind of answer you’ll get. -Get your point but if we can’t explain what matter is, how can we than talk about something that is not physical? How can you believe that consciousness creates matter? I am not saying that it isn’t the case, but why believe that? -Well you believe the other way around, you believe that matter creates consciousness and ideas. You’ve got to believe in something. We all believe in something, don’t you think? -No, I don’t believe in anything. I am not a materialist nor idealist. - You sounded like a materialist thou, Matthew smiled. -I am none of it, we cannot know anything for sure. Materialists believe that the physical world is the only reality that exist, idealists believe that the material world is an illusion and just a product of our consciousness, and dualists believes that there is an interplay between the physical and none physical world, which suggests that both exist. No one knows the real answer, no one has the key to unlock the door of objective truth. I think Kant was right when he stated that we can only experience the world from our innate synthetic a priori concepts, which means that we could never have access to the real true world. And yes, Kant considers to be an idealist, but not in the traditional sense. Anyways, all we can do is argue and believe so what’s the point? -The point! Well the point is that we are not just biological machines, but human beings with ideas, hopes and feelings. We all need to believe in something. -Sure, but believing in something doesn’t make it true, and I need the truth to believe in something! - But how interesting would it be if we knew everything and owned all knowledge about the world? -Look I know where your coming from alright. You are obviously a religious man, almost all idealists are. -Actually, I am not religious at all! -But why are you an idealist than? -As I said, we all have faith in something. I have a friend who believes in social and economic equality. That’s just human nature. It’s in our nature to believe. -Don’t really agree with you. I believe that faith is dangerous. - Because faith gives you hope, and hope is not a god think to have, I think. -Why is hope not a god thing to have, I don’t get it? Everyone needs hope. -Well, if you have hope and it doesn’t come true, you will just end up more disappointed than you were before. People usually get disappointed, at least I do, so why should I have any hope? What good comes out of it? -You have a pessimistic view on humanity. - Maybe I do but, I don’t care so much about humanity. I am just trying to survive on my own you know. People are egoistic and greedy in nature, why should I be any better than the rest? -Well John, I don’t believe that for a second, I believe that people are good in nature and want to do good deeds. I think that it’s in our nature to be cooperative and helpful. Weill Mathew, what can I tell you. You are a good man, but also a naive one. How can you believe that people are that good, when you see evil that man do every day? -As I told you from the beginning, I have faith and hope in humanity. - I feel sorry for you John, I really do. -Maybe I am a pessimist, but I can at least see the ugliness of mankind. - I have a strong feeling that something happened to you, John. - I don’t think you were always this way, something happened that made you change your mind. - You don’t know me! This is the first time we meet, so how can you think in such terms? - I just have a strong feeling about it. - You won’t like this Matthew, but feelings are primitive, I think reason should come first. Always! -Have you ever been in love John? -What does this have to do with anything? Is it because I said that feelings are primitive? - Yes, I was in love a few times. - How many times have you been in love? - Can’t remember, but it’s not many times. Perhaps two or three times. What does this have to do with anything? Don’t see your point. -I just want to get to know you better, that’s all. -I see what you are doing, you believe that my earlier miserable love life made me the pessimist I am today? -Did you ever have a longtime relationship? -Were you in love with them all? -What kind of a quotation is that? Of course, I was! You can’t be with someone you don’t love, at least I can’t. -That was not what I asked. -What did you ask? Said John a little bit irritated. -I asked if you were in love with them? -No, I wasn’t, are you happy, I wasn’t! I was in love a few times, but that love was never realized. I am sure your happy now, that’s exactly what you wanted to hear! How about you, were you ever in love? Did your love come true? -Actually, it did, and I am luckily married. -Look, I am sorry John. I didn’t mean to hurt your feelings. - Forget about it! I am the sensitive guy, said John with a smile on his face. - Yes, you are John. Didn’t know how far I could push you! - Look Mathew! Maybe my past life made me the way I am today, but it just proves that there is no justice in life. I had many friends that I cared about and loved in my life and they all turned their back when I needed them most. Things like that in life makes you lose faith in everything. You were maybe a lucky guy in life, but I wasn’t. I’ve seen the dark side of it and its ugly. -What do you know about my life John? We met 20 minutes ago on this train. -You’ve right. I don’t know you, but we don’t share the same experience in life, I believe that you have a naïve picture of reality. -Maybe I do have a naïve picture of reality, but it makes me feel human at least. -What times is it by the way? Matthew asked. -Its 5 pm, in2 minutes. -Nothing, the time goes so fast. Sometimes I wish I could just stop the time. -I know what you mean. Speaking of time by the way, this is where I go of. -I didn’t know this was your stop! I wish we had more time. Well, alright than, nice meeting you John. You take care, you hear! - The pleasure was mine Matthew. Good luck with everything. John stepped out of the train on the platform, took the lighter out of his pocket and lit a cigarette. He could fell the crowd drowning him and that’s what he liked about big cities. He was so unknown. As he walked across the bridge, he saw an old woman lying on the road. She wearied old clothes and smelled bad. She reached out her hand and asked for money. John stopped for a moment just as he passed her, turned around and gave her 100 SEK. -Son, she said, thank you very much. That was so kind of you, God bless you! -You need them more than I do, he said. -There are not much people like you! You are a very good man, she said. -Well I don’t believe I am good at all. - You have the three most important elements in life- Faith, hope and love. John begun to laugh. He couldn’t stop laughing. -I was just talking with a stranger on the train about these matters and believe me when I say that I don’t have none of these elements, John said. - why are you helping me than, said the old women? -I just wanted to help you! You need more help than I do, that’s all I guess. - There you go, you have all the three elements. - No, I don’t, said John. You are twisting this around. - If you didn’t have any faith in humanity, you wouldn’t have helped me in the first place. If you didn’t hope that you can make a difference by giving me the money, then why did you bother? And if you didn’t have any concept of love, which is the most important of all three of them, faith nor hope would have been possible. Isn’t that right? -No, it’s not. It’s just biblical. 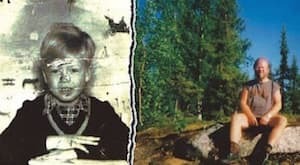 Slumpmässig novell - kärlek vid sista ögonkastet Slumpmässig dikt - 100 % Vuxen ?